You are here: Home / Faith / Canada / Part 1: Is the local church disappearing? Part 1: Is the local church disappearing? Peter Elliott is chair of the Vision 2019 Task Force – an exercise “to discern, dream, and decide where we think God wants the Anglican Church of Canada to be in 2019.” [WEBLINK: anglican.ca/v2019/report/index.htm (this link no longer works — ed.)] Elliott also headed an Anglican Diocese of New Westminster study group which, in 2009, presented a strategic plan called ‘Growing Communities of Faith in Jesus Christ to serve God’s Mission in the World.’ [WEBLINK: vancouver.anglican.ca] The plan analyzed what is required for a vital, sustainable parish. ‘Vital’ refers to the quality of the parish, while ‘sustainable’ refers to quantitative requirements. As a general rule, the strategic plan asserted that to be sustainable, a parish requires a minimum of 100 active adult members and weekly attendance of 70. Financially, a parish with a building and one priest requires about $130,000-$150,000 annually, or about 130 parishioners contributing regularly. Judged by these criteria, the plan revealed that almost three quarters of the parishes in the New Westminster diocese may be unsustainable: 25 percent have Sunday attendance of less than 50, and another 47 percent have 51-120 attenders. What does this mean for the local church? Is it a dying institution? Are these disappearing local churches further evidence of the decline of mainline denominations? 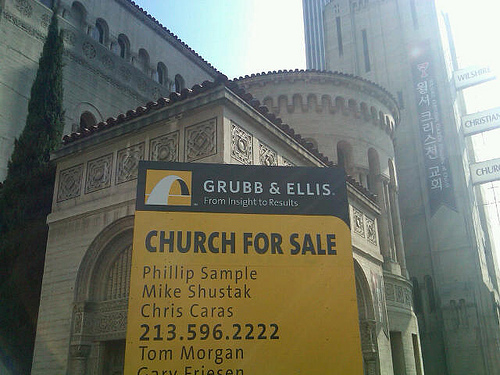 Is the neighbourhood church being replaced by some other form of church? To some extent, local churches are victims of larger trends. Weekly church attendance has dropped from about 70 percent of the Canadian population in the 1950s to 20 percent today. Not as many people are attending church, and this means there are not enough churchgoers in a given neighbourhood to keep some churches open. Elliott said many Christians look at the decline from the 1950s and see that as a problem. However, in Canadian history, it is the 1950s jump in church attendance that is the aberration, not the current situation. Church attendance has simply returned to its normal levels. Many of the churches that are closing in Canada are mainline Protestant churches, and this also is in keeping with larger trends. Mainline Protestant attendance in Canada has dropped by a third in the past quarter-century, while evangelical churches have grown by 50 percent. But are mainline churches closing because their denominations are in trouble, or are the denominations in trouble because their local churches are closing? Both may be partially true. Doug Goodwin, executive secretary of the British Columbia Conference of the United Church of Canada, suggested that it may be harder for mainline churches — with buildings and an established way of doing things — to adapt to new circumstances. But, he added, the same is true for long-standing evangelical churches. It is not so much that the local church is declining but that the institutional form of churches is changing, suggested Elliott. The point of the Anglican study was not to mourn the death of the local church but to determine the form of church that will serve God’s mission most effectively in the future. In some cases, that will mean churches will merge or close, but it may also mean that new churches will be started. Goodwin expects his denomination will see some experimentation. That may include deliberately smaller congregations, ministers serving more than one congregation and even buildingless churches. Another aspect of the issue has been highlighted by Geoff Ryan, a consultant for urban ministries for the Salvation Army. In an article in Comment online magazine, he noted that “between the end of the Second World War and the year 2000, approximately 400 (middle-class) church congregations” moved out of Toronto’s downtown area to the suburbs. This has left empty church buildings surrounded by the urban poor in the inner cities. Another part of the problem, Elliott suggested, is that many mainline Protestant churches were founded at a time when automobiles were not as prevalent and people went to neighbourhood churches. Now people don’t necessarily choose the church closest to them geographically. Goodwin agreed: “There are an increasing number of people going to destination churches.” These are often larger churches with more vibrant music and more diverse programs. David Wells, general superintendent of the Pentecostal Assemblies of Canada, has suggested that this nation has a pressing need for “wireless” churches that focus on going out and “and being among those who do not know Jesus” – in homes, schools and workplaces. Such ‘churches’ can impact a growing segment of the population who may become Christians without ever becoming members of a neighbourhood church. However, Wells also noted that there is still a need for “hard wired” churches, which invite people to come to a traditional church building and take part in worship services and programs. Different approaches are needed to reach different groups.